I’ve lost count of the gluten-free biscuit variations I’ve tried over the past couple of years. 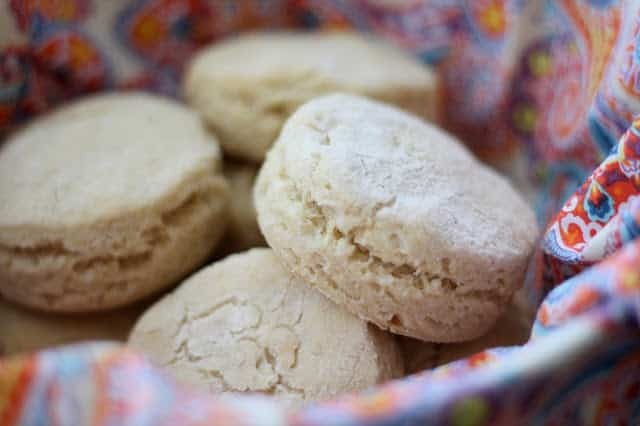 I was determined to produce a gluten-free buttermilk biscuit that was as fluffy, soft and tempting as traditional biscuits. Last week, a reader emailed me a recipe that I just had to try. (Thanks, Katy!) This version is loosely adapted from that recipe and I am very happy with it! 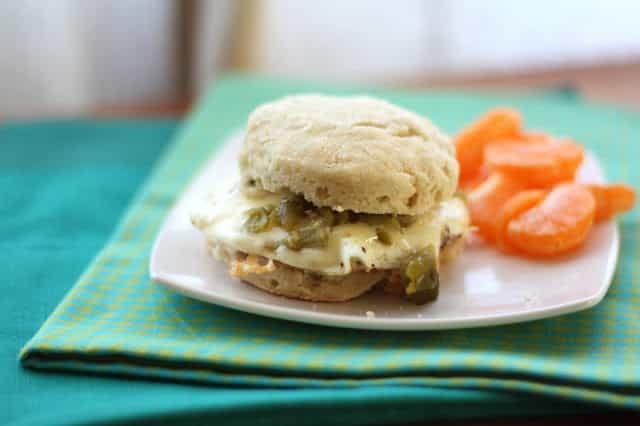 While working on this recipe, I’ve made these biscuits four times now in less than a week and my kids are thrilled about that. They have been eating PB&J biscuit sandwiches, breakfast sandwiches, biscuits with butter and jam, biscuits with whipped honey butter and biscuits on their own straight out of the oven. However, you serve them, they are delicious. Preheat the oven to 425 degrees. Whisk together the dry ingredients and set aside. Cube the cold butter as small as possible and then toss with the dry ingredients. Cut in the cold butter pieces until the mixture resembles a course meal with little pea size or smaller lumps throughout. I find it easiest to use a pastry blender for this task. Whisk the egg into the milk and then pour into the dry ingredients in the mixing bowl. Stir just long enough to combine. The mixture should be somewhat dry and just a tiny bit sticky at this point. If it is still wet at this point, add more brown rice flour just a tablespoon at a time. Sprinkle a tablespoon of flour onto a counter-top or a pastry mat. Dump the dough out onto this surface and sprinkle a half tablespoon or so of flour across the top of the dough. Lightly press the dough with your hands to flatten it to about 3/4"-1" thickness. Add just a sprinkling more flour as needed, to make sure the dough isn't too sticky. Use a biscuit cutter, round cookie cutter or drinking glass to cut the biscuit shapes out of the dough. You can also shape them with your hands, if that is more your style. Place the cut biscuits on a parchment or silpat lined baking sheet. Shape the remaining dough into biscuits with your hands. Bake for 14-16 minutes, until the bottom of the biscuits are lightly browned. (The tops of these biscuits will not brown much at all, so do not wait for the traditional golden top!) Remove from the oven and transfer to a basket or cooling rack. Enjoy! Good for you Mary! These look great. Your perseverance is impressive :) I sure love a good biscuit! These look and sound so perfect and tasty! Yum!! Yeah, can't wait to try these! I've been looking for a good GF biscuit recipe. Loved them quick question doubling the recipe .. would I need to change anything? Hi Katy, I don't think anything would need to be changed in order to double this recipe. Just go easy on the extra flour initially and only add more according to how sticky the dough is. Good luck! I'm glad you liked them. I am excited to try these! 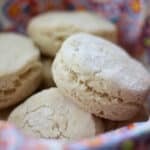 I love biscuits, but had a hard time finding a good gluten-free recipe for them. Thanks Mary! Have you ever made these ahead of time & frozen them - before baking? If so, do you bake straight from freezer or thaw first? I have not tried that. I've frozen the leftover biscuits, after baking them though and it worked fine. If I were going to try it, I'd probably put them in the oven frozen. (The same way I do with frozen cookie dough.) If you try it with the uncooked biscuits, let me know how it works for you! I made these tonight and they are fantastic!!! super easy to put together, the texture AND taste are just delicious! Thanks =) and on to try more of your recipes! Recipe looks good! But a question: do you have any ideas on substitutes for the brown rice flour? Trying to not use too much of it because of arsenic concerns. You should be able to substitute oat flour in this particular recipe, Rachel. I hope that helps! I made these with a oat flour, almond meal, rice milk and smart balance spread, and they are delicious! You should be able to use those flours interchangeably. I simply prefer the flavor of brown rice flour, just a little bit nutty and more reminiscent of whole wheat, and it's nutritional benefits. I've swapped them in the past though without any trouble at all. Thanks Mary. I will let you know when I try biscuits and how they come out.